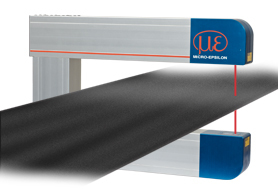 The profilometer of the thicknessCONTROL.TTP series accurately measures the thickness profile of tire tread or side walls during the extrusion process and enable therefore an efficient control during production as well as a fully recorded quality control. The systems of the TTP family are equipped with optical sensors and have an application specific operators´ frontend which provides all necessary data regarding the organisation of the extrusion process of running surfaces and side walls. Systems of the RTP series can be applied as low-cost solutions. The TCP 8301.I is based on the light intersection method. On each material side a line is projected crosswise on the measuring object via a laser light source. The profile is detected by a camera. The geometrical data are calculated from the distance of the cameras and the signals from the lower and upper material side. A long-term and temperature stability is achieved by an automated in-situ calibration. The TCP 8301.ET is based on laser triangulation sensors and therefore ensures the measurement being independently from material constants. The system is designed as O-frame, both sensors detect the thickness according to the differential method. In order to ensure highest precision, the laser beams of the sensors are accurately adjusted during the production process using optoelectronic tools which have been specially developed. The system is ideal for monitoring high-dynamically processes due to its high measuring rate. The triangulation sensor applied on the upper side is combined with an eddy current sensor which monitors the distance of the two optical measuring sensors while allowing a software-technical compensation of temperature-induced changes of the measuring gap. Additionally, the compensation sensor is applied according to a special alignment with the measuring task in order to ensure both, a huge measuring gap and highest precision. The TCP 8301.ET is similarly to the TIP8301.ET regarding its functionality. However, they differ concerning the application- or process specific user interface and the corresponding analyses software. The TCP 8301.CT is based on laser triangulation sensors and therefore ensures the measurement being independently from material constants. The system is designed as O-frame, both sensors detect the thickness according to the differential method. 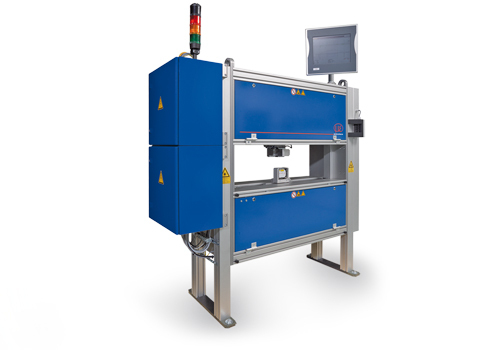 In order to ensure highest precision, the laser beams of the sensors are accurately adjusted during the production process using optoelectronic tools which have been specially developed. 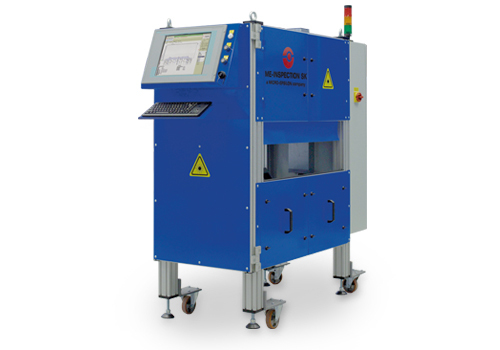 The system is ideal for monitoring high-dynamically processes due to its high measuring rate. The O-frame mechanics of the system dispose of a compensation frame which does not vary with temperature and which is used in order to avoid temperature fluctuations of the measuring frame using further sensors. The TCP 8301.CT is similarly to the TIP8301.CT regarding its functionality. However, they differ concerning the application- or process specific user interface and the corresponding analyses software.